I’m starting to introduce another regular activity into our weeks, and that’s a trip on Thursday to visit friends in their houses. Today was the first, and I’ve already booked out next week, so if you’d like a visit (and live within driving distance), let me know! Today we went to Clayfield to visit “my former work colleague J” and her gorgeous two. I only intended on staying for the morning but actually only got around to leaving at 4.30 with the threat of commuting traffic prompting a hasty exit. We shared a lot about our lives and could have probably talked for another day before we ran out of things to say. 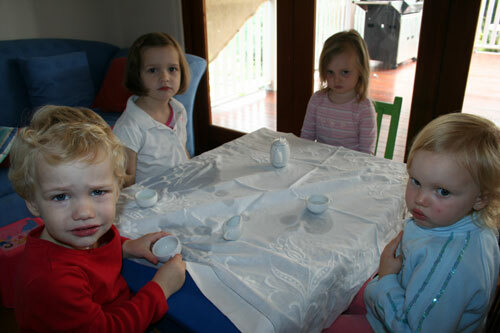 The kids started off by having a tea party, but my two were not very friendly. J and her husband have fully renovated a beautiful old highset house. It has fresh, white walls and gorgeous polished floorboards. J has impeccable taste (she says “I have a champagne taste but a beer budget”) and has done wonderful things with the kids’ rooms by sticking to a adult-friendly scheme. In fact, you could probably walk into J’s house and not know that that she has children. (Oops, there, I spotted it! The only give-away: a booster seat at the outdoor dining set.) She has it organised that well! However, if you’re invited in properly and taken downstairs, you’ll find that the kids are hardly missing out. They have a wonderful playroom that opens onto a concrete floor underneath the large, entertaining deck. 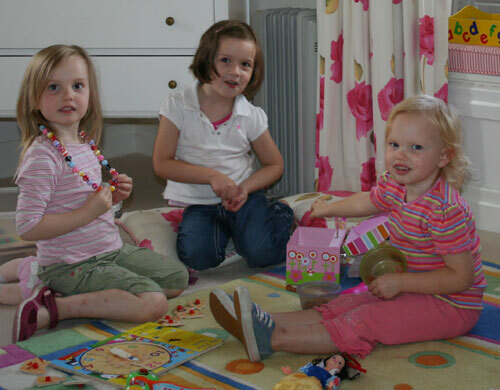 The playroom is neatly packed with a train set, books, oodles of toys and beanbags and child-sized furniture including a high-chair, pram and oven. Just outside, tucked into a little corner is a collection of ride-on cars, bikes and trikes. And still on the concrete, but undercover so it doesn’t get the rain, is a raised sandpit. Just the right height. A treasure for little hands. I couldn’t keep Brioni away from it! Now I’ll have to see if I can talk David into building me a sandpit like that. A couple of swings and a cubby make the play area complete. A playroom, a sandpit, grass, sunshine and a toilet not far away — what else do the kids need? Wow. What a house. Perfectly balanced between the needs of the adults and the children so that neither is compromised to their own detriment. J’s an inspiration for those of us who live with pre-schoolers but don’t want our house to look like a kindergarten. Thank-you Lauren! I love your storytelling skills and the pics are cute too!